Thank you for visiting our site! Please do click on the Facebook LIKE button on the homepage to get our regular facebook updates on our products. For any product inquiry, please send us an email or click on the "Request a Quote" tab under the product for more information and we will reply to you. Kindly do note that we take anywhere from 2 hours to 2 weeks to reply to emails depending on our work orders. We thank you in advance for your understanding and patience. For any queries please SMS before calling (no whatsapp pls). Please see below for detailed directions to our store and please call only if you are unable to locate the same. We thank you in advance for valuing our time. From Park Sheraton Hotel on TTK Road Alwarpet- Come on TTK road for around 2 kms. You will come to a Traffic Light where you will see Samco Hotel at the signal. Make left at the traffic light. This is Eldams Road. Keep coming on Eldams road. You will cross CP Art Center on your left, then a small church. You will see the CHAYA board soon after the Church on your left. On the opposite side of this lane will be HomeLife Furniture / Punjab National Bank. There is a small auto stand also in the corner of this lane. 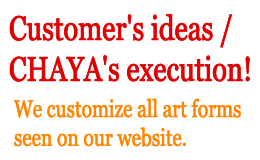 Make left at the CHAYA Board sign and you will find the store on your right on the ground floor. There is parking outside the store. If you see McRennett Bakery on your left, you have gone too far. 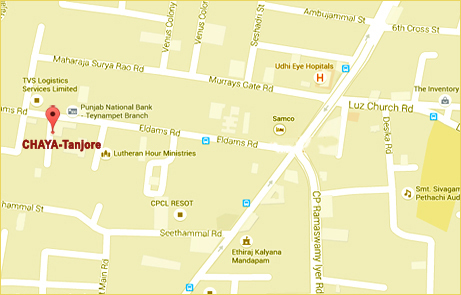 You can also come via the Teynampet Side, however since that is a one way, one has to come only from the Alwarpet Traffic Signal side. We look forward to welcoming you to our store as well. 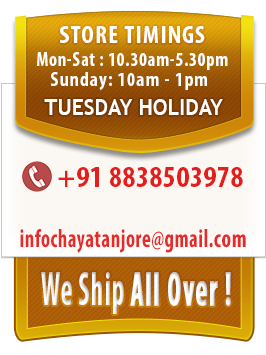 *Please refer our FB page www.facebook.com/chayatanjore for any unplanned holiday/timing updates.